The recent Supreme Court decision to repeal the aggregate contribution limits law (McCutcheon v. FEC) will allow an individual to submit the maximum allowable contribution to as many candidates as he/she pleases. 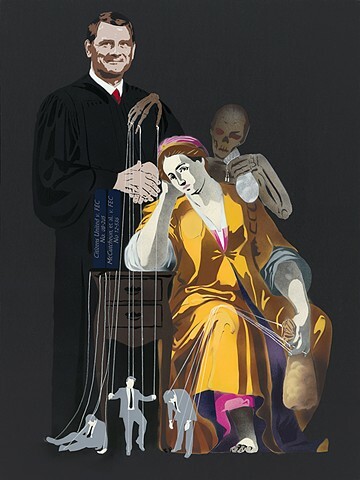 This satirical composition coalesced around Chief Justice Roberts' case opinion in which he argued that, except for strict quid pro quo bribery, money doesn't corrupt democracy. This perspective is at odds with what a majority of Americans believe (as evidenced in public opinion polls) and suggests a disconcerting lack of sensibility in the High Court. With over a dozen members of Congress indicted or convicted on quid pro quo political corruption charges between 1980 and the Citizens United ruling, did the Court not seriously consider that those seeking political favors would view these rulings as providing vehicles of influence that would shield them from such corruption prosecutions? Perhaps the Chief Justice would re-consider given the recent first instance of an indictment on corruption charges stemming from the receipt of campaign donations (Sen. Menendez (D, NJ))? The composition is a portrait of Justice Roberts and 'Avarice', appropriated from Jacopo Ligozzi's Allegory of Avarice (1590). Avarice is holding a sack of coins and, with her skeletal companion, controlling marionette puppets (politicians). This imagery represents the widely shared public opinion of an unequivocal connection between campaign contributions and political influence.